In order to help the Corinthian Christians understand who they were as God’s people, the Apostle Paul used the image of the body. In my last post, I explained that he mixed metaphors a bit in revealing that every single Christian is immersed into the body of Christ. Generally we don’t think of a solid being immersed in another solid. By this odd image, Paul emphasizes the extent to which we are necessarily and deeply connected as Christians, whether we realize it or not. We are all members of the same body. Paul continues his discussion of the church as a body by noting that “the human body has many parts, but the many parts make up only one body. So it is with the body of Christ” (1 Cor 12:12). As his argument develops, he shows how silly it would be to expect all Christians to be the same. “Suppose the whole body were an eye,” Paul suggests, “then how would you hear? Or if your whole body were just one big ear, how could you smell anything? . . . What a strange thing a body would be if it had only one part! (1 Cor 12:17, 19). What a hilarious image! 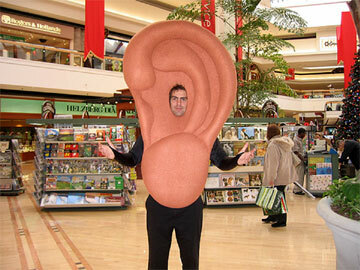 Just picture the human body as one giant eye or ear – hardly a body at all! The human body, if it is to be a real body and not a monstrosity, must be composed of different parts. So it is with the church. Those Corinthians who devalue the contribution of others because it is not like their own stand corrected by the humorous picture of a monstrous eye. Yet if the parts of the body are different, that does not make them separate from each other, because “the many parts make up only one body” (1 Cor 12:12). Each individual part of the body is necessarily connected to the whole body. Thus there is a fundamental unity among the diverse body parts. In the body of Christ, the distinct parts, so variable and different from each other, are unified as one body. Thus Paul wraps up his analogy by saying, “Now all of you together are Christ’s body, and each one of you is a separate and necessary part of it” (1 Cor 12:27). It’s that simple: one body, many parts; one unified body made up of diverse parts. That’s simple to say, I might add, but not to do. Most Christian communities have a very difficult time living with diversity. Uniformity is so much more comfortable. If we all look about the same, dress about the same, talk about the same, and vote about the same, church is so much simpler. If we all agree on music styles and sermons lengths, worship wars are fought on somebody else’s turf, not our own. But, unfortunately for our comfort, that’s not what it means to be the church of Jesus Christ. God has intentionally composed the body of Christ to be diverse. In our efforts to make it uniform, we end up like Victor Frankenstein, creating a monster rather than that which God designed. Uniformity of basic belief is essential for Christian unity, of course, but most of us yearn for uniformity that touches far more than theological fundamentals. If we are going to live in unity as the diverse body of Christ, we need divine help. We need to love as God has loved us in Christ, which is exactly why Paul follows his discussion of the body in 1 Corinthians 12 with his famous “Love Chapter” in 1 Corinthians 13. As I mentioned earlier in this series, Paul was not the first to apply the image of a body to human community. But his use of the body imagery in 1 Corinthians 12 was quite different from what the Corinthians might have expected. I’ll explain what I mean in my next post in this series.